On Monday, the global markets absorbed a nasty shock, with massive selloffs rocking the Chinese stock market, and sending shockwaves through the rest of the global economy — the Dow was at one point down by a staggering 1,000 points, but rebounded to finish down about 600 for the day. Tuesday has brought slightly rosier news for the rest of the world, thankfully, with the U.S. markets showing positive gains, but that doesn't mean the concerns are over. 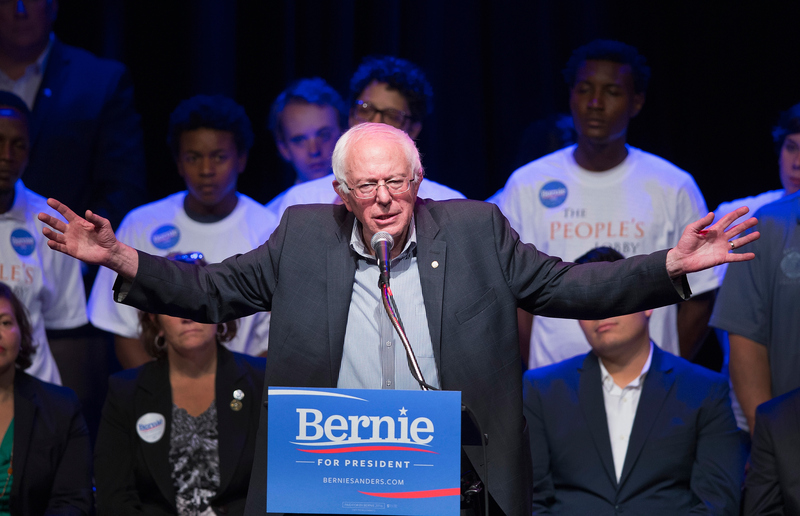 So, here's a question: Where does Bernie Sanders stand on the economy? It's a sensible question, given his unique strain of equality-focused, populist rhetoric on these issues — perhaps no presidential contender over the last few decades has run on as progressive an economic platform as Sanders'. He has, in simple terms, positioned himself as a direct antagonist to Wall Street in a number of hot-button areas, like CEO bonuses, corporate taxes, and billionaire greed. But as good as his domestic economic agenda might sound to a progressive audience, it's hard to predict global market downfalls that hurt the U.S. economy, and harder still to chart the best way forward. Sanders' outlook is pretty clear, however — on Monday, amid news of the trouble in China and the impact it was having on U.S. markets, Sanders railed against the legacy of "unfettered free trade." Sanders' tweet drew some ire and derision from conservatives and pro-free trade types, thanks to his hyperbolic use of "unfettered" — global trade is undeniably subject to varying oversights and regulation, even though many progressives would like to see a change in this regard. But the tweet, like his broader economic platform, give some good insight into how Sanders views economics, both international and domestic. Here are some of the economic achievements and Wall Street-related advocacies that Sanders' campaign chose to trumpet on their website. All in all, they give you a pretty good measure of the man's views — the only question is whether you agree with them, as an increasing number of would-be voters seem to. The part about breaking up big banks is a pretty representative example. The larger and more consolidated banks become, and the more intertwined their toxic assets are (over-the-counter derivatives trading effectively lit the fuse on the 2008 financial collapse), the bigger the risk to the overall economy. Sanders' firmly pro-regulation track record speaks to his preference for mitigating potential harm over pushing a breakneck, deregulated economic pace. And if you're curious about just how negatively he views free trade, this might want to give this a read: Sanders wrote an op-ed for The Guardian in April lambasting the Trans-Pacific Partnership. Trade deals like the North American Free Trade Agreement (Nafta), the Central American Free Trade Agreement (Cafta) and the granting of Permanent Normal Trade Relations to China have been abysmal failures: they allowed corporations to shut down operations in the US and move work to low-wage countries where people are forced to work for pennies an hour; and they are one of the reasons that we have lost almost 60,000 factories in our country and millions of good-paying jobs since 2001. Taken in sum, if Sanders has one guiding economic principle, it's probably protecting Americans from economic hazards and impacts rooted in the economic conditions of other countries — he has a lot of policies/views that fall in line with trade protectionism, in other words. And while it remains to be seen whether enough mainstream voters would embrace this outlook for Sanders to win a general election, there's no denying that there's a lot for an average American worker to like in his platform — his call for a $15 per hour federal minimum wage, for example.